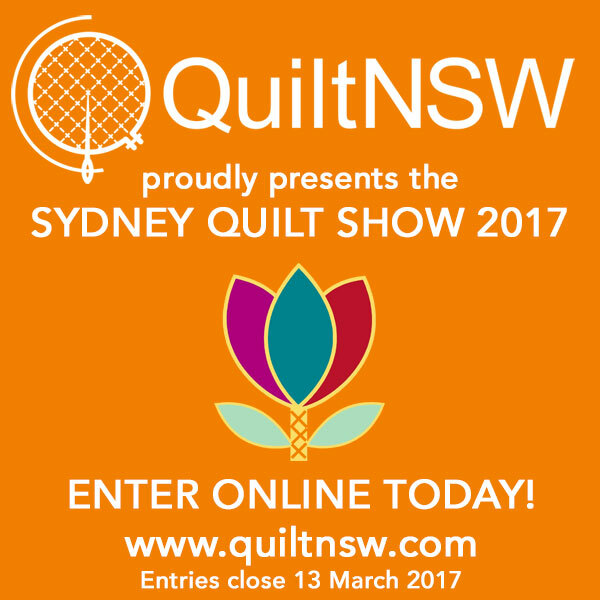 Entries for the Sydney Quilt Show 2017 are now open! Entry Form – online entry preferred! 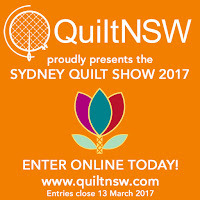 Membership Form - entry is open to current QuiltNSW members. It's not too late to join for 2016/2017! The closing date for entries is 11.59pm Monday 13 March 2017. We encourage you to use the ONLINE ENTRY FORM as it streamlines the payment and data collection process and allows our volunteers to better administer entries. Pay by credit card through our secure ANZ portal and you’ll receive immediate email confirmation of your entry on payment. To conserve resources, the entry form package will NOT be distributed in the February issue of The Template. You may contact the QuiltNSW office and request that a paper copy be mailed to you. 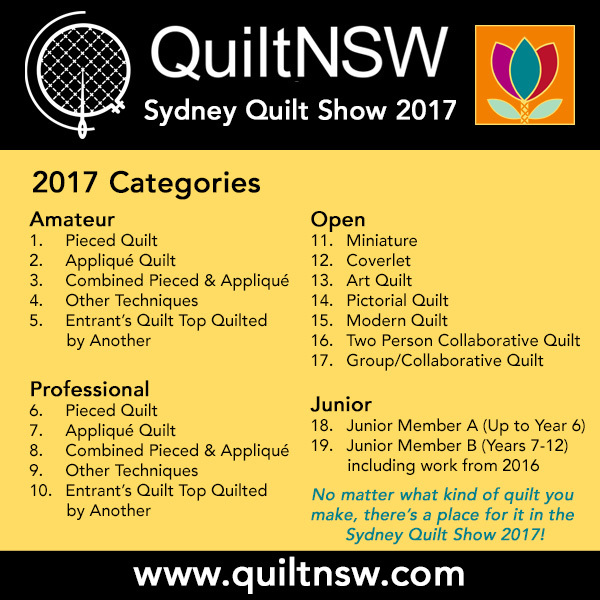 QuiltNSW has undertaken a comprehensive review of categories and awards for Sydney Quilt Show in consultation with members. This graphic gives you an overview of the revised categories for 2017. No matter what kind of quilt you make, there’s a place for you to share it. Follow the Flow Chart to help you choose your category. There is also a new sponsor award: Imaginative Use of Fabric Award: clever fabric play. 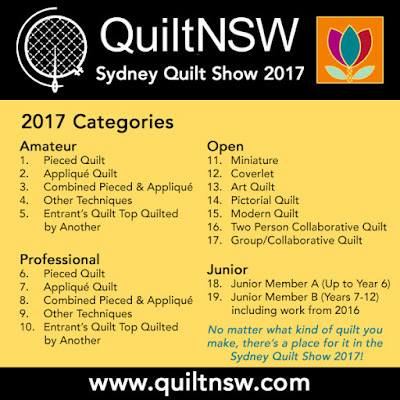 All judged quilts are eligible for this award. Download 2017 Categories & Awards for a marked up document showing changes from 2016. How do I prepare my copyright permissions (if applicable)? As a Quilter we see patterns in everything doors, buildings, floor tiles and in my case, I even recall pausing the TV, while watching Game Of Thrones, to take a picture of the stain glass star window in the grand hall! So why not a painting or photograph? Last year twenty quilters attended classes at Material Obsession, Drummoyne and My Sewing Supplies, Kirrawee for 10 months doing a course entitled “Abstraction - Colour and Design in Art Quilts” using a text by Rolina van Vliet, “Painting Abstracts”, edited by Search Press, for their inspiration. 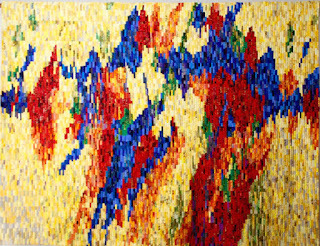 Their final works are 1x1 metre abstract quilts, based on a painting from the book. These 20 quilts will be exhibited at Hazelhurst in February 2017. As well, there will be 9 quilts from Robyn Eves’ group of “ Whispers II”, where an original photograph inspires the first quilter and subsequent quilters take their inspiration from the previous quilter. At the end, it is interesting to see where the process has journeyed. Hope to see as many quilters as possible support fellow quilters and, perhaps, stop for coffee or lunch in the excellent cafe on site. Rolina van Vliet has kindly allowed her images to be used. The quilt shown is taken from one of the images in the book.